Taborsky: "Not only science of handball, but analysis too"
First ever EHF Scientific Congress in Vienna. 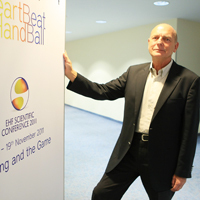 The first ever EHF Scientific Conference will be opened with a keynote speech entitled ‘Phenomenon Handball’ by Dr. Frantisek Taborsky, Chairman of the EHF Methods Commission. The goal of the conference is to bring professional and scientific experts together in order to describe and formulate problems of modern handball on all organisational levels and forms (male/female, youth, beach handball, street handball, disability handball) and to bridge the gap between science and practice in handball. Speaking ahead of the conference Frantisek Taborsky was looking forward to the exchange of ideas and meeting of minds. "After founding the Union of University Handball Teachers (UUHT) last year, it was our plan to have a conference with all of them and even more experts," said Taborsky. "We expected that 30 participants would join this conference, but now we have 80 experts with 55 presentations. This conference should also be an exchange platform for the participants and the universities. "Additionally all presentations of this conference are combined in a book and on our web periodical platform. But it is not only the science, but also the analysis of handball, as most of the participants are coaches, too." To download the publication that accompanies the conference please click HERE. For more information about the publication click HERE.